With Berkeley having become a political battleground for the far-left and far-right, its City Council on Tuesday approved the police chief's request to lift a 20-year-old ban on the department's use of pepper spray. The City Council during a special meeting voted 6-3 in favor of Chief Andrew Greenwood’s proposal. The decision comes just days before former Breitbart News editor Ben Shapiro is scheduled to make an appearance at UC Berkeley, and that event is expected to draw protests. Berkeley Mayor Jesse Arreguin said the new rule will allow police officers to use pepper spray on violent people in a crowd — not for crowd control. "They understand that we are asking them for this tool for specific circumstances where we deal with potential where folks can use violence to possibly break through a police line," Greenwood said of the council's decision. Until Tuesday, officers had been prohibited from using pepper spray as a way to control crowds, Greenwood wrote in a memo to the City Council. However, it can be a mode of "effective intervention in violent crowd control situations involving direct coordinated attacks on police lines," he continued. Greenwood stressed the Berkeley Police Department’s commitment to upholding people’s First Amendment rights – no matter where on the political spectrum they may fall. In 2017, however, "Berkeley has been the focus of an unprecedented effort to be made a battleground for extremist groups," Greenwood wrote. The city has experienced a spike in "violence and criminal behavior" by these clusters of people "who have launched brutal and determined attacks against officers and people whom they have determined should not be allowed to speak or publicly assemble," he added. Greenwood listed chaotic and bloody riots that broke out at "March 4 Trump" and "Patriot’s Day" rallies. 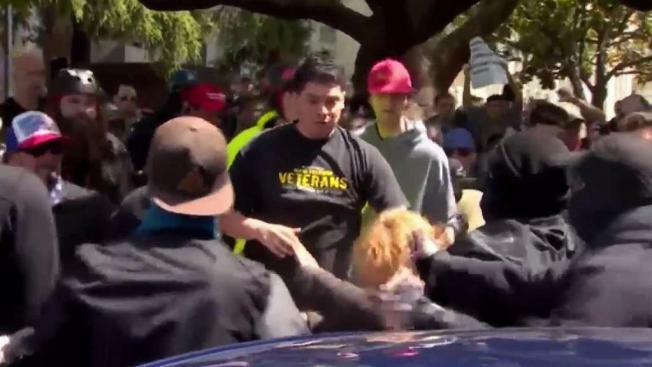 In both cases, hundreds of protesters descended on Berkeley, fights broke out, some people were injured and others were arrested, and property was destroyed. On Aug. 28 again, more than 100 black-clad Antifa members pushed their way past police barricades, and attacked right-wing protesters. To make his case, Greenwood on Tuesday displayed an arsenal of weapons that were wielded at the numerous protests. He also brought along photographs, one of which showed officers in riot gear responding to an explosion at Martin Luther King Jr. Civic Center Park. "We want you to see for yourself weapons brought to the fray," Greenwood said. Protesters were also armed with shields, which rendered most of the police’s non-lethal weapons useless, Greenwood said. "Pepper spray is markedly more effective against those using shields, as shields do not give full protection against the effects of directed, focused applications of chemical irritant," Greenwood explained. Berkeley police officers have been permitted to use batons, projectiles and tear gas. However, tear gas emits "a cloud of chemical irritant" that has the potential to impact even peaceful demonstrators or witnesses, he wrote. Batons pose "an inherent risk of injury to both suspects and officers," he added. By contrast, pepper spray makes it possible "to repel specific attackers," Greenwood said. "The availability of pepper spray as a force option to use against specific violent offenders in a crowd situation would allow for more safety for officers and the public, and increase the likelihood of apprehension and criminal prosecution of suspects, while reducing the potential for injuries to suspects and officers," according to Greenwood. Nearly all police departments across the United States use pepper spray as an "intermediary form of force as an alternative to tear gas and batons," Greenwood wrote. It is widely recognized that pepper spray’s benefits include "cessation of attack and creation of space between police and violent individuals and their targets, and opportunities to carry out focused arrest efforts on violent offenders," he wrote. The lack of that option has restricted Berkeley police officers so "unchecked violence can escalate, creating a need for more significant use of force," Greenwood said. Police officers are expected to submit "Use of Pepper Spray" reports to the City Council every time a pepper spray canister is used. It will also not be used against peaceful demonstrators or observers, and officers will make a concerted "attempt to limit collateral exposure to non-involved parties." Further, Greenwood wrote, "Where there is probable cause to arrest for a crime, officers shall prioritize where practical the arrest of individuals upon whom pepper spray has been deployed." The timing of Tuesday's meeting was determined by the fact that the University of California, Berkeley is preparing to host controversial speaker and former Breitbart News editor, Ben Shapiro, on Thursday. The city and campus reportedly amassed roughly $600,000 worth of damage in February when Milo Yiannopoulos, an "alt-right" speaker, who also worked at Breitbart News, was scheduled to speak on campus. Thousands rioted, starting at UC Berkeley and ending up in the streets of the city. Yiannopoulos’ speech was canceled, but that didn’t stop protesters from setting trash on fire, lighting fireworks, vandalizing businesses, and starting fights. Arreguin has called on UC Berkeley leaders to nix Shapiro’s speech. However, the university has demurred because registered student groups are permitted to invite speakers of their choice to campus, according to spokesman Dan Mogulof. Thursday’s event will unfold on campus, but Berkeley police officers could be asked for assistance, officials say. UC Berkeley is also preparing for Free Speech Week between Sept. 24 and 27, during which controversial speakers Milo Yiannopoulos, Steve Bannon and Ann Coulter are expected.